Is this new mini camcorder a worthy update to its older brother? 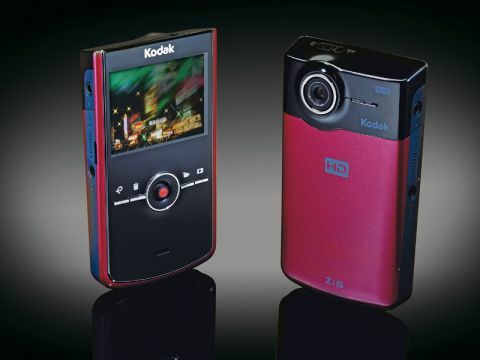 Kodak's latest pocket digital video camera, the Zi8, is an object lesson in why an impressive spec sheet does not necessarily make a good product. At first glance, the Zi8 answers all the criticisms we had of the Kodak Zi6. And yet, while our general impression is positive, niggles remain. The image stabilisation can smooth out small jitters from using it hand-held, but you may be disappointed. The 1080p recordings, while technically impressive, are a little dirty at 100%, and while the Zi8 claims 30fps, it often drops below this and videos are sometimes a little stuttery. Alternatively, you can opt for 720p at 30 or even 60fps – great for slow-mos, though there's some annoying vertical banding. Video, though, is generally good. Low-light performance, in particular, is striking at this price point and the convenience of plugging the Zi8 directly into your Mac and dragging a neat series of clips across, ready to be edited in iMovie '08 and later, is most welcome. In giving the case a slicker, more designed feel (available in raspberry, as above, black and aqua) Kodak is treading a difficult line; one of the charms of this kind of camera is that it doesn't feel precious, and yet the smart finish here runs counter to that. It also makes it more slippery than we'd like; it wriggled out of our hands and onto the pavement more than once during testing. You'll start to notice after a while that the internal mic isn't exactly a great performer at the natural distance from which you frame your subjects, but you can at least plug in an external one. The mic jack seems to be a little noisy, however.